This article was published in http://deeperblue.net and is published on therebreathersite.nl with permission. “Why did you come up”? The PRISM Topaz/Invader is a computer controlled digital mixed gas closed circuit rebreather. PRISM stands for Peter Ready’s Incredible Steam Machine. Peter has been designing and building rebreathers for over fifteen years. Many rebreathers have not been truly independently tested. True capabilities and capacities are left to the buyer to figure out on their own. The Topaz has recently successfully completed manned, phase three, testing with the United States Navy. Making the Topaz the first and only off-the-self, commercially available rebreather ever to pass this rigorous and independent testing. The navy is looking to replace and upgrade its aging fleet of MK 16 rebreathers. The Topaz comes in at just under 45 pounds / 20 kilos fully loaded. 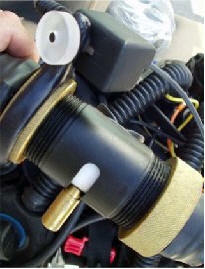 This makes the Topaz the lightest available rebreather with its capabilities. The unit carries six pounds / 2.7 kilos of absorbent. Tested and true duration ranges from five hours with appropriate reserves in 40 degree F / 5 degrees C at high workload and all depths to twelve hours at moderate workload in 60 degree F / 16 degree C at or shallower than 70 feet / 21 meters. All rebreather absorbent duration is temperature dependent. Make sure that any unit you plan to use has the duration expected for the temperatures you plan to dive in. Absorbent duration changes dramatically as temperature changes. 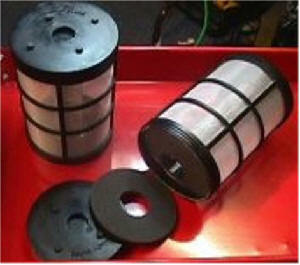 Canister (area that houses the absorbent in the scrubber) duration is greatly affected by design of the scrubber. The Topaz utilizes a radial scrubber. The breathing gas enters the center of the canister and radiates outward toward the outside of the scrubber. This is the most efficient scrubber design while allowing proper time for breathing gas to fully interact with the absorbent material at all depths. Not all rebreather canister designs will accommodate diving to all depths. Some designs can lead to mass loading (absorbent failure due to gas volume and flow) below certain depths. The Topaz does not have this issue. It is fully capable of dives well below 300 feet / 91 meters, assuming the diver is trained to go there. The Topaz utilizes an over the shoulder counterlung design. Work of breathing, static lung loading and breathing resistance are all minimized with this design. The unit is very easy to breath in any body position at all depths and is fully capable of handling helium mixtures. Counterlung design incorporates water traps and drains to allow for recovery from non-catastrophic floods. The Topaz has manual and solenoid driven oxygen addition. This allows for manual override of the electronics to fly the unit at partial pressures above selected set points. 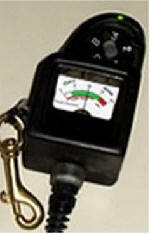 The diver can choose to perform set point switches or let the unit control oxygen levels independently. An automatic and manual addition valve combined into a single unit controls diluent addition. Simple design makes descents simple, easy and almost effortless. The Topaz controls oxygen set point via a digital computer controller with a true voting system for the three onboard oxygen sensors. The electronics are fully potted. The digital electronics allow for simple push button calibration. 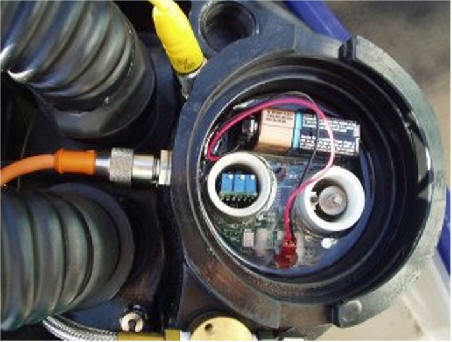 There are five pre-selected set points (0.7, 1.0, 1.2, 1.3, 1.4 ATA oxygen) available to the diver. Electronics and unit status is displayed via a heads down LED display that mounts at lower eye level on the mouthpiece ring. The heads down display allows for hands free continuous unit status to be read at a glance. The display incorporates set point status with high alarm, low alarm and at set point lights. Alarm displays included sensor, battery and oxygen status alarms. All electronic and solenoid operations are fed by a 9 volt battery. Typical operation time on a single battery is over forty hours. 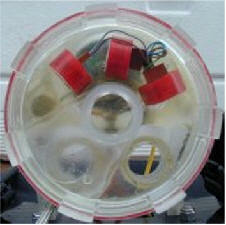 The oxygen solenoid is outside of the breathing loop. A simple on/off switch allows the user to turn the unit off or on as desired at any time. One of the unique features on the Topaz is a true secondary display. This display is easy to read and allows the diver to check each sensor’s status totally independent of any electronics or battery. The secondary displays oxygen partial pressure levels for each sensor driven solely from the voltage outputted by the sensor itself. 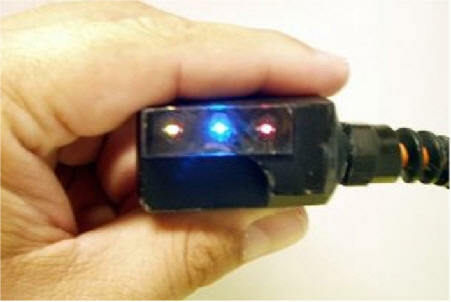 This allows the Topaz to be operated easily with the electronics turned off and/or no power available to the unit. In fact, electronics failure or loss of battery power is not a bailout situation with the Topaz because of this feature. The secondary also displays battery voltage and unit set point. The Topaz easily adapts to various cylinders sizes, allows for use of a cover for increased hydrodynamics or flies equally well without it. The unit has off board diluent bailout built-in. ** Of course, the unit is bubble less unless the diver is ascending and provides release of expanding gas on ascent with a standard over pressure relief valve. However, most users simply exhale out of their nose for more intimate control of the process. The Topaz is equally suited for recreational diving or technical diving. For the recreational diver, the unit offers long durations with optimized breathing mixtures all in a small package. This allows for much longer durations at greater depths than available while diving open circuit within no stop limits. Like all rebreathers, the Topaz provides a warm and moist breathing mixture. Plus, it allows the diver a much quieter diving experience. The lack of bubbles makes a huge difference when approaching or observing wildlife. It is a real advantage to those divers that are looking to capture wildlife video or photos. Researchers from the University of California at Davis have been utilizing the Topaz to tag hammerhead sharks in the Sea of Cortez. Previous attempts at tagging using open circuit equipment proved completely unsuccessful. The animals did not approach close enough to the researchers to even allow for an attempt at tagging. The first time the researchers used the Topaz they were successful. The United States Fish and Wildlife Service has been using the Topaz to conduct research on the California Sea Otter. Video and film productions have used the Topaz to allow for the long durations and close approaches to wildlife needed to capture images for broadcast. 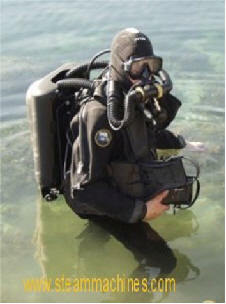 For the technical diver, the unit adapts well to customization and adaptation for specific mission logistics and needs. Many users have incorporated stainless steel backplates and harnesses into the unit. 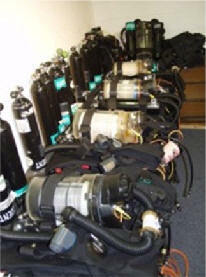 The small size and long duration allow for the unit be easily staged or carried for long duration dives. In fact, the Topaz was recently used in a 20,000 plus feet / 6,200 meter cave penetration in Australia. Establishing a new world record for maximum cave penetration from a single entry/exit. The increased gas efficiency and duration while optimizing the breathing mixture builds in more time on deeper and/or longer dives. This added reserve of gas allows for more time to be able to deal with difficulties at depth, time that is not available to the open circuit technical diver. Certainly, all of these benefits do come at a cost. The Topaz retails for $7,800.00 US. Considering what the unit delivers, this is not unreasonable. If you cannot program a VCR, rebreather diving is not for you. It does involve the need for discipline and maturity in approach. Use of checklists, predive preparation and post dive cleaning is all mandatory. Steam Machines provides a complete user manual with both pre and post dive checklists included. Training on the Topaz is unit specific and only offered through factory-authorized instructors. The typical course is five days and costs $1,000.00 to $1750.00 US depending on what is included and instructor requirements. Courses typically do not include travel, diving or instructor expenses. Students need to be certified divers and have a nitrox certification. Training approaches closed circuit diving as an activity for individuals that want the benefits of diving the Topaz, yet have and display the mindset to safely use the unit. Training is completely recreational initially to a maximum depth of 130 feet / 40 meters within no stop limits. Development of a closed circuit mentality is central to the Topaz approach to training. The student learns not to simply dive the rebreather, but how to survive well on one. This involves all the practical procedures and techniques unique to rebreathers with the addition of learning how to diagnose the unit and think “closed circuit” while diving. Technical training is available as a secondary level. Users must have at least 100 hours of dive time on the Topaz and display the ability to operate the unit well before entering this level of training. Technical training incorporates the use of diluents other than air, diving below 130 feet / 40 meters, and with required decompression stops. The training is mission oriented and designed for those divers that have the desire and need to go beyond the standard recreational limits. Other specialized training is available. Optional: 13’s, 15’s, 17’s, 19’s, 30’s & 45’s. Fully digital, true voting system. approx. 40 hours @ 70ºF temperatures based upon a standard high quality alkaline such as Duracell Ultra. If you are interested in learning more about the Topaz visit www.steammachines.com. Thanks go to steam machines for their help and photographs. I want to thank deeperblue for there kind permission. Prism has an Air 2 built in which runs off the onboard diluent bottle. Some of the customers plumb in a second stage to an offboard tank. For further backup they run a high flow LP hose to the diluent reg on the unit which gives them either the Air2 to use or the secondstage on both onboard or offboard tanks.